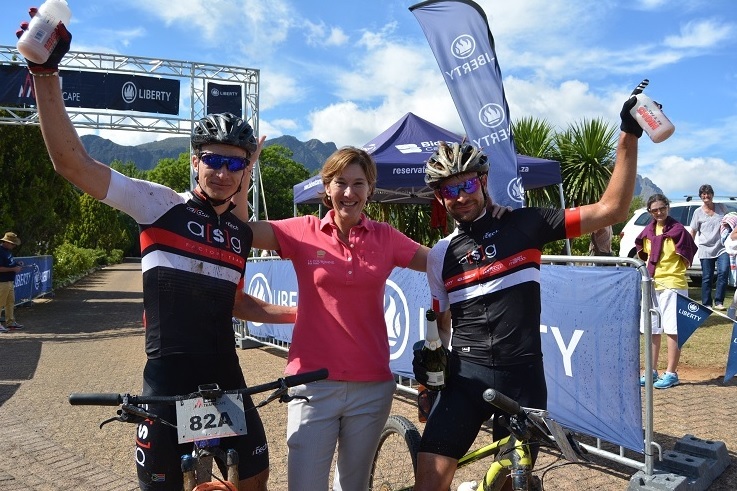 South Africans HB Kruger and Stuart Marais conquered the Liberty TransCape MTB Encounter at their first attempt when they were crowned overall UCI Elite champions in Franschhoek in the Western Cape today. Taking control from the outset of the 73km stage from Houwhoek, the ASG-Ellsworth pair crossed the line at La Couronne Wine Estate in 2:50:16. That gave them an overall time of 19:32:36, ahead of second-placed Eirik Fiskvik and Thomas Engelsgjerd of Norway (20:19:02). In today’s stage, the French-German team of Antonin Marecaille and Julian Biefang (Chiru-Magura-Canyon) were second, followed by Hanco Kachelhoffer and Pieter Seyffert (Ellsworth-ASG). Marecaille and Biefang finished third overall. Marais, from Howick in KwaZulu-Natal, said they went to the front early on in the final stage. “There was quite a lot of single-track and we didn’t want to get stuck behind on that section,” he said. Looking ahead to his next challenge, Marais, who concentrates on cross country, said the TransCape had helped him in his plans to for the World Cup race in March. South Africa will host a cross-country leg of the UCI Mountain Bike World Cup on March 10 in Stellenbosch. The Paarl-based Kruger said the riding he had done in the TransCape, which is supported by STANLIB and Volvo Cars, had fitted in perfectly with his programme for the year. Germany’s Udo Mueller, who led from the start, secured the solo men’s category and said it had been “a fantastic week”. He finished in 21:13:06 and was followed home by Switzerland’s Roland Mueller (no relation) in 21:35:20. British star Catherine Williamson retained her mixed category title, partnering Belgian rider Kristof de Neys to victory in 22:31:42.